I’ve been spending a lot of time in my new car lately. You would, too, if you had a Cadillac CTS-V Wagon, and you also had a Nissan Cube. You’d think to yourself: Boy, I really hope the city doesn’t come by and tow the Cube. But you’d never actually check, because you really hope the city does come by and tow the Cube, and that the truck carrying it accidentally rolls off a cliff. So I’ve been driving the wagon a lot, and I’ve quickly learned something: absolutely no one notices it. You might think this annoys me, but it doesn’t. Really. I used to have a bright orange Lotus, and everyone noticed that, to the point where people would come up to me at gas stations and ask me, often very loudly, WHAT’S THAT THING? and then I’d have to spend the next five minutes explaining how Lotus isn't owned by Ford. Of course, the Cadillac is different. I didn’t expect many people to point it out on the street. But I did expect the occasional car guy wave, because the V wagon is sort of a car enthusiast litmus test. Casual car guys – the ones who post pictures of their Honda Accord Coupe on Facebook with the caption “My new sports car!” – would never notice. But you and me – real car guys – take note, and get excited, and point, and you know, maybe give a thumbs up or something. So why isn’t that happening? I’ve been pondering it for some time now (roughly 45 minutes), and I believe I’ve come to a solid conclusion: Lots of enthusiast cars are driven by non-enthusiasts. Obviously, this isn’t true of all enthusiast cars, so please don’t send angry e-mails that say: I HAVE A BMW M5 AND I DON’T EVEN HAVE HAIR, I SHAVE MY HEAD, AND I’M THE BEST DRIVER IN THE WORLD BECAUSE I CAN SHAVE MY HEAD AND DRIVE. I know some of you are enthusiasts, and that’s why you’re visiting Jalopnik in the first place. But many aren’t. I think there are two possible explanations for this. 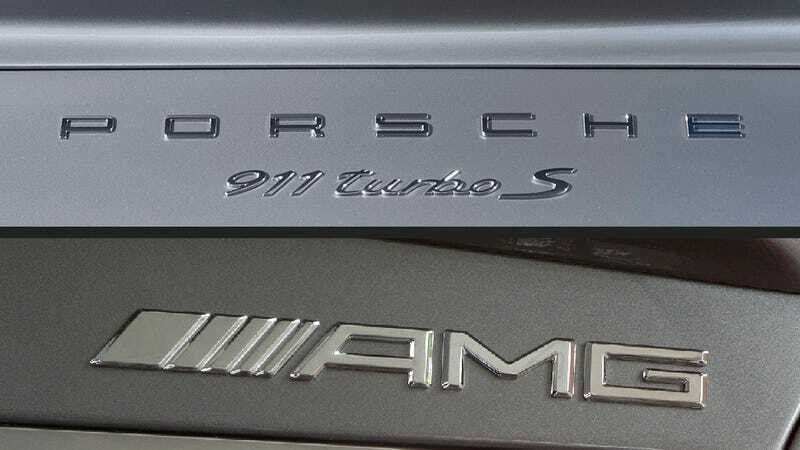 One is that some drivers simply walk into a showroom and insist on “the best” of a certain model, regardless of whether it has a high-performance nameplate like AMG or M. I have a friend who once owned a Volvo S60R, and he would strike up conversations with other S60R owners in parking lots, and they would never have any idea their cars were anything special. Surely they went into the Volvo dealer and asked for a “top of the line” S60, and the salesman was all too eager to show them an S60R in that turquoise color no one else wanted. Another explanation is that drivers buy into the marketing of sports cars rather than the actual sportiness. For example: you see a billboard for a Corvette. You’re a dentist with some money to burn. A few weeks later, you’re cruising down the road at the speed limit in your V8-powered, two-seat sports car as you text your hygienist about Timmy Johnston’s retainer. 1. AMG cars. When I had my AMG wagon (this is the most pretentious sentence opening in modern world history), I would often glance at other AMG drivers in traffic in order to establish some sort of AMG-owning bond. But they were almost always on texting, except for S-Class AMG owners, who were yelling at their subordinates on Bluetooth. 2. New Porsches. My girlfriend says I make too much fun of my former employer in my articles, so I will qualify this with a few nice words: new Porsches are really fun to drive. But the truth is that very few of their drivers would ever know that, because most of them are driving very slowly to an upscale restaurant. So, Jalopnik: which “enthusiast” cars do you find are often owned by non-enthusiasts? Do you agree with my assessment? Or are you an AMG owner who’s so pissed off that you will send me an incredibly angry e-mail as you drive home from work? I’m OK with that. But how about a thumbs up if we meet in traffic?